August 2009 Archives - mudd up! The RRR cassette was polarising, but it was also personal and fragile; and I had the sense that if I didn’t listen closely, it might pass unnoticed. I knew nothing about these groups, but it was obvious that an individual with photocopier access and a dual cassette deck could make a substantial difference in their world. This scene had a tangible scale. It stood within grasp, which suggested that I could actively participate in music – any music, especially the weird stuff – rather than remain a well-informed consumer. …and here’s a PDF of the entire article. August winters are not my thing. 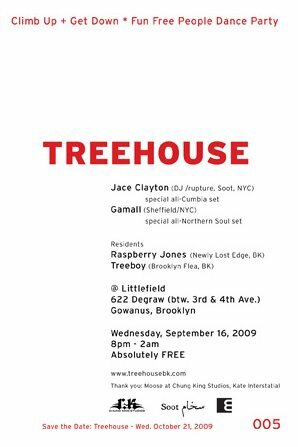 But even on birthdays the blog/(w)internet economy = free free free, here’s a bass-loaded b-day gift from me to you. Wrong direction, I’ll know… but you’ll take what you can get. And, as always, you are welcome to donate to the webhosting fees of MuddUp! 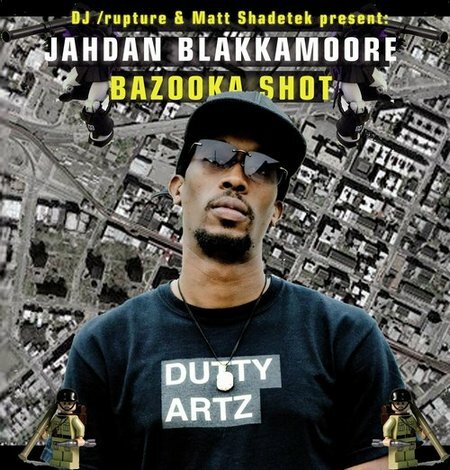 Jahdan Blakkamoore – Bazooka Shot. I built this along w/ Matt Shadetek, 14 new jams from JD in anticipation of next month’s Buzzrock Warrior album, also produced by Matt, myself and the Dutty Artz family. 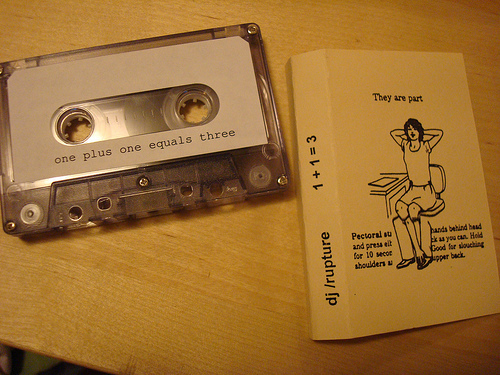 Before Gold Teeth Thief and Minesweeper Suite and Uproot and all of that, there was my 1st mixtape, 1 + 1 = 3. It is strange for me to hear this mix now, in part because I can no longer ID all the tracks! I usually remember what the record artwork looks like, but sometimes the artist/label/track names have escaped me. And in part because my technical reach and narrative pace has expanded since then. It also makes me think about how our whole way of finding (& mixing) music has changed in the past 10 years or so. When this mixtape came out, in order to get reggae and dancehall I had to trek across Boston’s segregated cityspace out to Blue Hill ave. in Dorchester. 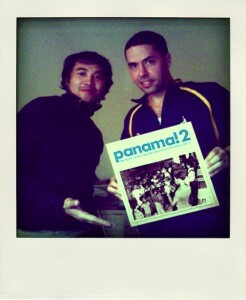 Pre MP3 smorgasbord, we would haunt the record shops & tape the radio. Learning paths through music pre-Google, pre-blogosphere, before Ms Internet + Mr MP3 got married and made us all their children. 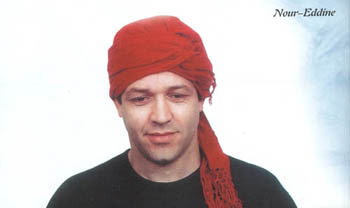 When interviewers ask me some variation on ‘why Arabic/north African music?’ I tell them that I’ve been listening to it for as long as I can remember (I can only remember as far back as high school: pathetic, I know), that it’s as familiar to me as the other stuff I DJ. Which this excerpt — 9 minutes from the start of side B — illustrates. apparently, sometimes Safari thinks that this site contains malware. I’m looking into it… if it does, it won’t be there for long. Apologies for any hackery weirdness. Alva Noto & Anne-James Chaton vs. a Japanese vending machine. Literally minutes after my arrival in Mexico City this spring, we found ourselves in a packed restaurant with fluorescent lighting, and 3 flatscreen TVs all on the same channel. I was eating the best octopus taco I’d ever had. A wrinkled old man walked in, going from table to table carrying an ancient wooded box with ‘Toques’ engraved on it. Scrappy wires attached two metal rods to the box. He was selling electric shocks. Apparently it’s something you do, sometimes, often when drunk: friends buy a ‘touch’ , hold hands, and everybody gets mildly electrocuted. About 10 minutes after he left a young woman comes in selling books of poetry. I’ve been plenty of places where someone comes in with their homemade chapbook, but she had ‘real’ books from a publishing house. 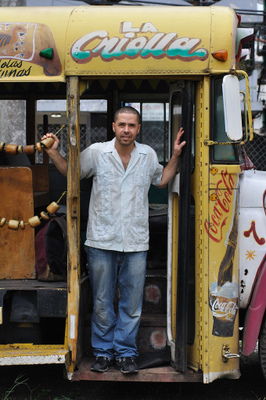 While neither vendedor ambulante made any sales (to my knowledge), at that moment I fell in love with D.F. Electric shocks and poetry. There has been no turning back. Out of all the places I have ever been to (many, trust me..) this is the place I’m most looking forward to return to. 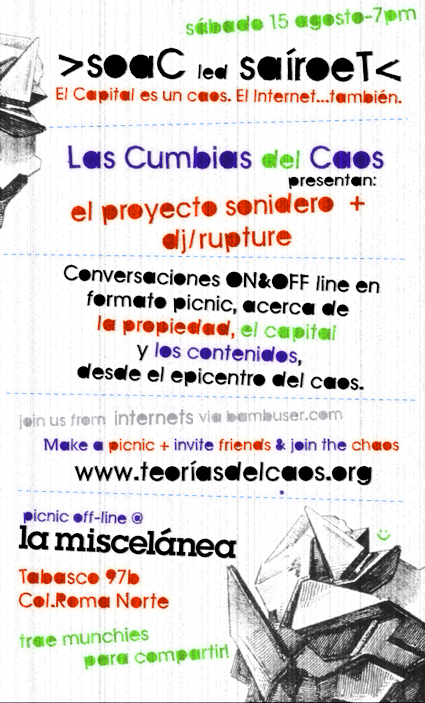 So I’m pleased to announce that next Friday, I’ll be back in Mexico for a picnic…. “off- and on-line conversation about property, capital, and content, from the capital of chaos.” In this edition of ‘Theories of Chaos’, the invited speakers are Mariana Delgado of Proyecto Sonidero and myself – we’ll be talking about these issues in relation to our other love, cumbia. Needless to say, I’m super excited. After the nocturnal picnic, we’ll head over to the Centro Cultural de Espana (this event is also free) where I’ll DJ their roofdeck party. 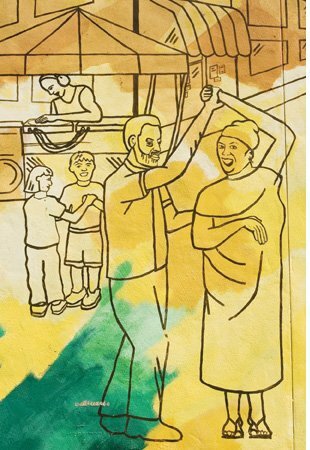 here’s a quiet, melodically intense old cumbia from Los Wawanco, an international assortment of musicians based in Argentina. 50 Years of Partying! announces their website.